The season is upon us and most of the auditors are back from up north, looking forward to working through the fleet and completing your audits. Most importantly some of the new rules especially Cat 5 are worth looking at. Due to all these changes we are currently upgrading the Yacht Safe Software as a Service “SaaS” and the site is in maintenance mode. Access will begin again on the 17th of September then you can start the process by completing your Safety Declarations. Along with the administrative changes, we are adding some great new tools for the Sailing Admin team and owners alike, Like a more robust security system using SSL encryption, and now all check boxes have the N/A field, so if you are unsure use these then your Auditor can sort it out on the day. I will the other announce these in due course. 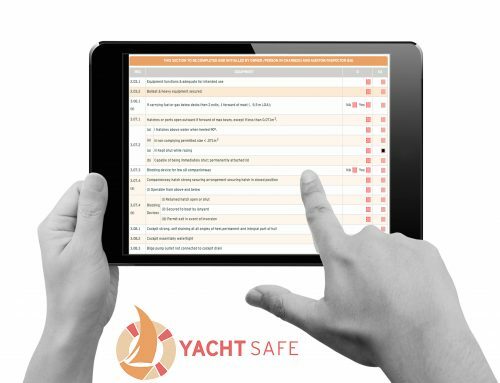 Once Yacht Safe is again active, the auditors will populate their calendars and you will be able to book an appointment, once you have submited your declarations. we plan to have a couple of weekends booked out with (5) five auditor’s so hope to get through all the boats in a timely manner, we will send another note to you in relation to this once we have decided some dates. It’s very important for you to completed the declaration, for compliance, we can catch up with you in due time for your audit. Please use the next (2) two weeks to your advantage, download the paper forms from the link and get ahead of the game, some things to keep in mind will be. Life Jacket Service Dates and Records. Flare Kits, Check Expiry Dates. Any Equipment with an Expiry, Check it ! First Aid Kits, update and restock. Radio’s Make Sure They Work. Have a general look around, make sure your yacht is in good condition, especially if she has not been out for a while. Should you experience any issues, such as log in passwords etc, please, in the first instance direct these queries to the Sailing Office or Mike Williams and they will get onto me, I will assist them or call you directly, I don’t anticipate any issues however should they occur we will get right onto them for you.